Backpacking Kenya. Lake Baringo, relaxing and local life. If you are planning a budget trip in Kenya, here you can find useful information about prices, services, etc., in Lake Baringo. We went there by public transport, slept and ate in local places, and enjoyed this relaxing and quiet place.Recommended! Good place to feel real Kenyan village atmosphere with quite easy access. Lake Baringo: a fresh water lake, in a hot, dry and low valley area, surrounded high escarpments (cliffs), few people around this arid land. North of Nakuru and Marigat (you will cross the equator at Mogotio, where there´s a globe monument). Except goats, cows and small birds, don´t expect too much wildlife around, unless you take a boat ride and go further and maybe meet crocodiles and hippos. 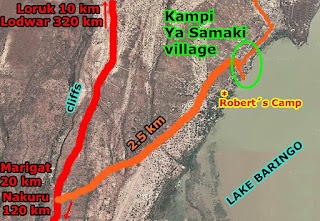 The main village, with tourist facilities, in Lake Baringo, is Kampi Ya Samaki (“camp of fishermen”), 20 km north of Marigat, on a bad road. The area suffered floodings in 2012&2014, get informed if travelling in rainy season. May 2015 was OK.
There´s no entrance fee to the lake and we didn´t see any toll for cars either. - Eldoret - Kabarnet (140 km): 300 sh, 1h45, small matatu. Good tarred road. - Kabarnet - Marigat (40 km): 200 sh, 1 h or less (down), small matatu. Tarred road, potholes, under repair. Marigat is the biggest town close to Lake Baringo (20 km). There´s a bus station. - Marigat - Kampi Ya Samaki (20 km): 100 sh, 45 min, shared car. The road was tarred but now it´s in bad conditions. Kampi Ya Samaki is 2 km away from the main road, just on the lake. Just be patient to fill the car, same the way back! - Kampi Ya Samaki - Nakuru: Just a couple of direct cars , very early morning (5:00, 7:00; 400 sh), not very convenient schedule for travellers. We took a shared taxi to Marigat, and matatu to Nakuru. - Marigat - Nakuru (100 km): 300 Sh, 1h30, matatu. Marigat - northern Kenya: there are truck-buses in Marigat bus station heading to remote areas in the north, Lomut, Lodwar-Turkana. 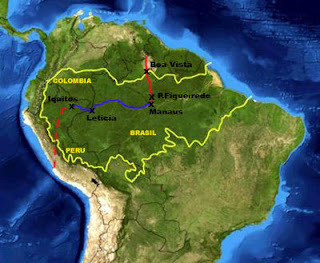 Ask about safety situation first, as problems are around (cattle thiefs, oil exploration...). Beautiful! From the big green farms around Eldoret, passing Iten the “champions´town of Kenya”, you will see many athletes training (accommodation in Iten if needed). Great views above the Kerio Valley with high cliffs and Torok waterfall, where the road goes down and up again to Kabarnet. KerioValley is very little populated, dry savanna area. There´s Kerio National Park (west of the road, 25 $ fee). Kabarnet is a rural town on the edge of the Tugen Hills above the Kerio Valley. Nothing to really stop you here but you can find accommodation in Kabarnet (cheap, 800 sh room). Then the road goes down to Marigat- Lake Baringo area, great views. 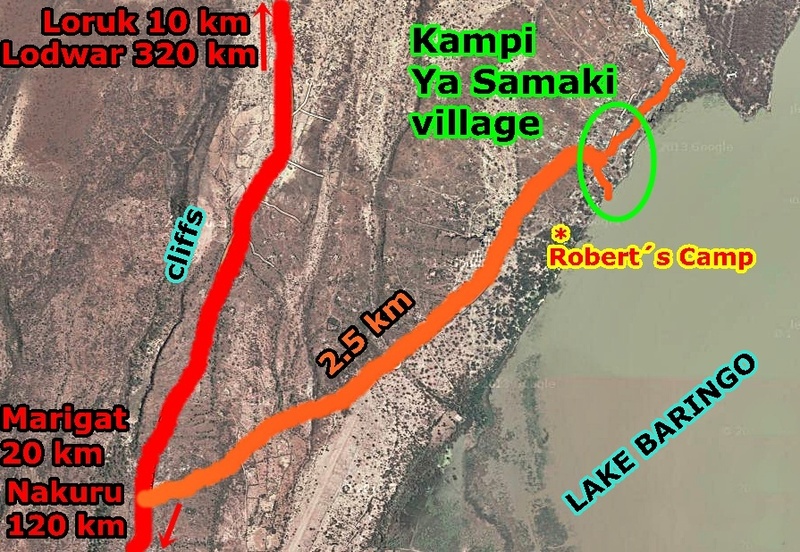 There are 2 local accommodation options in the village of Kampi Ya Samaki. Making Lake Baringo a very affordable destination for low-cost travellers. Great! Weaver´s Lodge: where we stayed. Prices: 600 Sh, self-contained single room (bed was big enough for us). Double room: 1.200 sh. Clean and correct. The place from outside doesn´t look terrible, but rooms are OK.
There´s a bar, but it was quiet, no music (even if we stayed there for the 1st of may holiday weekend). Maybe we were lucky, cause during the day no electricity in the village. Bahari Lodge: the cheapest option in the village, only shared WC. We didn´t see the rooms. 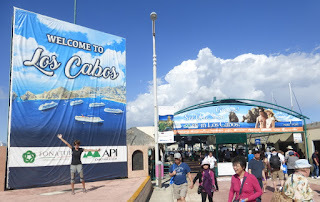 Robert´s Camp: a very popular place for foreigners. Prices: special for tourists, no local ones. Camping: 700 sh/pp. Bandas x 2 people: 5.000 Sh (WC). South outside the village, on the lake shore. Other expensive lodges around, some luxury ones. Also on the main island on the lake. The area is quite popular for expats coming from Nairobi and other highlands areas. There´s also accommodation in Marigat, but no real reason to stay there. Small restaurants but not too much food avalaible in the evenings. Bahari Lodge and Restaurant is the main option, they offer chapatis (10 sh only! ), vegetables, ugali, rice, fish and chicken. 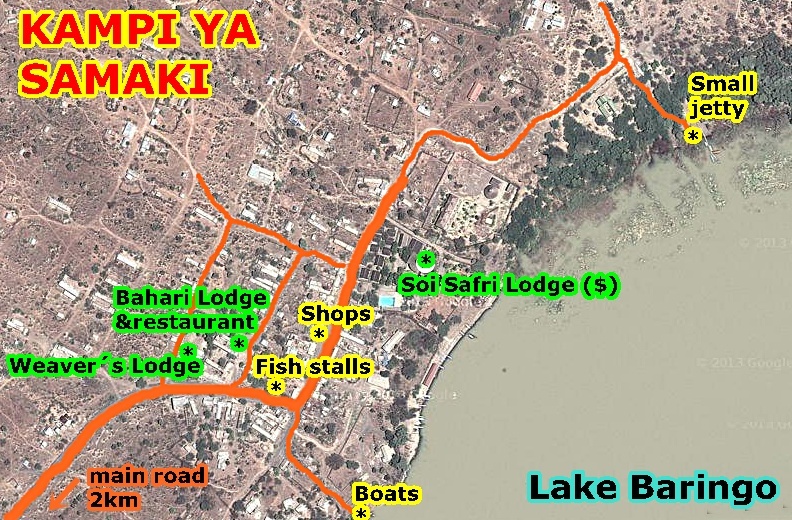 Kampi Ya Samaki is mainly a fishermen village and in the evenings, the ladies sell fried and smoked fish, very cheap (30-100 sh). Small basic shops, also some limited meat, fruit and vegetables. Water bags (20 sh) and bottles are also sold in the shops. Not too much in fact… Just good to feel the atmosphere of a small Kenyan village. The shores of the lake around the village are quite dirty (there´s a lot of garbage around the area), many dry trees (the levels of the lake have changed). Not so many birds, at least around the village. Most of them small. It´s not a swimming lake (crocodiles and hippos… and also not so clean…). You can walk around the village, houses and paths around. Traditional life. Boat trip: 1.000 sh/boat/1 h (but they will try to charge you more). If lucky, you will see crocodiles and hippos… and birds. There are many tour offices shops in the village, and many guys will offer the tours. Or just go down to the small port. And talk with the boat drivers. On the island, they told us there are hot springs. Cliffs: you have to walk to the main road (around 2 km), the cliffs are there, different levels. It´s hot to walk around. 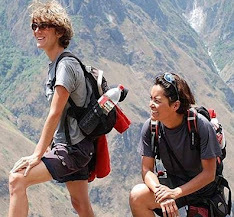 We didn´t go, we saw the views of the lake from the Kabarnet-Marigat road. We didn´t go but here´s some information. Not managed by KWS (national parks). Famous for its geysers and hot springs, hippos and birds. They told us flamingos are here now (not anymore in Nakuru). 3 different gates: Loboi, 25 km east of Marigat (try to get a shared car from there) and 2 other gates southwest 25 km from Mogorio (60 km from Nakuru). The eastern part of the lake is closed to visitors. Campings inside the NP are expensive (20$/pp), also camps outside the gates. We arrived at Eldoret, after crossing the Uganda border. A big nosiy town in the south-western highlands, a stop on the main Uganda-Kenya road. A few big hotels around the main taxipark, correct and similar prices, and also smaller and darker guesthouses. Check. Mahindi Comfy Hotel: where we stayed. Price: 1.000 Sh, single self-contained room. Double room: 1.500 Sh with 2 beds. TV (but no channels). Clean, correct. Quiet at night (back room) but loud music outside early morning. Thank you very much for sharing all the Information. We found it helpful! We have visited Lake Baringo and really enjoyed it there. We stayed in a local acommodation directly in the village Kampi Ya Samaki and were very lucky to meet HARUN. Harun is a motivated, reliable and absolutely fair guide who speaks English, French and some German. Even though we were a bit sceptical in the beginning, we soon learned that Harun can be trusted. On the first evening Harun showed us the whole village without asking for a single penny. On the second day we made a boat trip with him. He gave us a fair price and was easy to negotiate with. We are writing this because we think that people like Harun should be promoted.